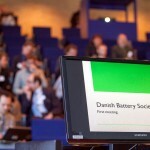 Since the foundation of the Danish Battery Society one year ago, we have noticed significant interest in collaboration and knowledge sharing – both within and outside the society and both nationally and internationally. To facilitate this further, we have decided to host a yearly battery symposium. The main focus of the symposium is on current and future battery activities in Denmark with updates from research and industry. To give an international perspective on the development, we have invited four international speakers working with atomic layer deposition of thin-film batteries, SEM and TEM characterization of Battery materials and high-power battery integration. We have posted the agenda for the symposium along with the agenda for the general meeting here on our website. After the symposium we will host a dinner. The society will cover half of the dinner costs so that we can offer this possibility for only DKK 200 per participant. You can sign up for the conference and as a member at the same time to get your discount at our website. If you arrive by local train from either Jægersborg or Nærum, you have to go up the hill towards building 95, follow the facade round to the southern entrance at building 94. When you enter the reception, you will be guided from here. 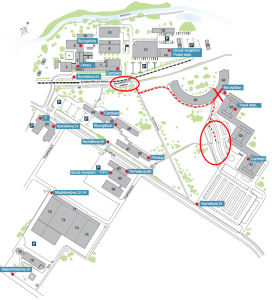 If you arrive by car, you might be able to find some guest parking in front of building 91, 92 or 93 by entering at Nymøllevej 91. 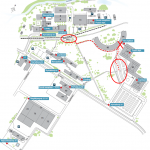 Walk to the eastern reception in building 94 where you will guided to the venue.